Oil Companies Like ExxonMobil Have Known About Climate Change For Decades : 13.7: Cosmos And Culture Oil companies once led in climate science; if they put a fraction of their profits into the search for alternative renewable fuels, they could ensure our collective well-being, says Marcelo Gleiser. In the current issue of the New York Review of Books, David Kaiser and Lee Wasserman, the president and the director of the Rockefeller Family Fund (RFF), respectively, explain why the organization decided to divest its holdings on fossil fuel companies. Although the divesting decision is broad-ranging, they single out ExxonMobil for its "morally reprehensible conduct." 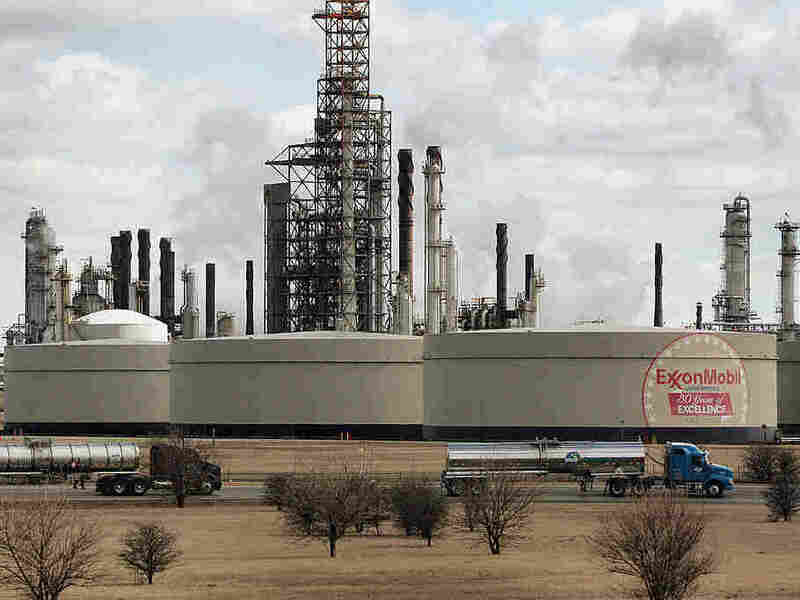 "For over a quarter-century the company tried to deceive policymakers and the public about the realities of climate change, protecting its profits at the cost of immense damage to life on this planet," they write, condemning ExxonMobil for not only covering up its cutting-edge research findings on how fossil-fuel burning affects the global climate, but also for willfully promoting an agenda of deception, aiming at confusing and influencing public opinion by turning a scientific issue into a political one. Could this be true? Could a trusted American company, with revenues larger than the gross domestic products of countries like Austria and Thailand, plot to deceive the public? That's what the RFF determined, after funding a team of independent investigative reporters from Columbia University's Graduate School of Journalism to research what ExxonMobil and other U.S. oil companies actually know about climate change. In a nutshell, the team of journalists found that ExxonMobil has known for decades that the burning of fossil fuels is the dominant cause of global warming. "Models predict that the present trend of fossil fuel use will lead to dramatic climatic changes within the next 75 years .... Should it be deemed necessary to maintain atmospheric CO2 levels to prevent significant climatic changes, dramatic changes in patterns of energy use would be required." This memo was circulated within the company, and sent to a number of the company's leading scientists, who are supposed to report to the company's leadership. The investigative report from the RFF is quite clear in its findings. Yet, few people know about this. Shouldn't the public be outraged at this? Shouldn't people boycott ExxonMobil, stop buying its products? Shouldn't all large investors (and smaller ones) divest their holdings from this company? Divesting a company is a direct form of action based largely on a moral argument, aiming at both proving a point and at exerting pressure. It becomes the currency of those who want to make a difference without waiting for governmental regulations — which depend on slow-moving, fluctuating partisan political decisions — to take place. The leaders of ExxonMobil and other oil companies want to maximize profit. This is not surprising, given that this is what any company wants to do. The more profitable a company, the more valuable it is and the more assets it has. This is the so-called bottom line, which, put simply, is the balance sheet of the company: The more it makes, the more its shareholders make. There's nothing wrong with a company wanting to maximize its profits. What is objectionable is how far it's willing to go in order to do so. Where do you draw the line between healthy ambition and immoral greed? Cigarette companies have done similar things, as reported in Merchants of Doubt: How a Handful of Scientists Obscured the Truth on Issues from Tobacco Smoke to Global Warming by Naomi Oreskes and Erik Conway. Tobacco companies knew as early as 1953 that cigarette smoking can kill. Through a large-scale effort of deception, including undermining the credibility of serious scientific studies on the deleterious effects of smoking, the tobacco companies managed to stall public awareness for decades. Oil companies are using similar tactics, focusing on their short and midterm gains, caring nothing for what comes a few decades down the line — even if our global future, including the health and social stability of this and the next generation, is largely dependent on it. We live in an era of rising corporate ethics, where many companies understand the importance of aligning with sound science to guarantee their long-term profitability. To declare war on scientific findings and public awareness is to declare war on our joint shared future. Divesting a company, be it at the individual or at the foundation portfolio level, packs a meaningful punch: It tells the company that it is acting against its main interest, in a process that can only be described as self-destructive — it is compromising the very resources that keep it alive. If people stop buying from a company at a large enough scale, the company folds. The campaign against public awareness of climate change is a desperate decoy; like the scared octopus that jets out a cloud of black ink to hide itself from predators, the oil companies are trying to hide their findings to protect their morally questionable intentions. The tragedy here is that what the oil companies consider to be a "predator" is the climate science they once led. The octopus doesn't have any other choice. But the oil companies do. They could invest a fraction of their huge profits to reinvent themselves, becoming true leaders in the search for alternative renewable fuels, while retraining their work force into the emerging new technologies. This way, instead of holding back the planet and millions of workers in a decadent economics model, they would become the companies of the future, working to ensure, and not to destroy, our collective well-being.